Seems there was nothing Montgomery Ward didn't sell at some point during the 20th century. Those who remember Ward's department stores in big malls may find it hard to imagine that they were once into mail-order groceries in a big way – but much like with Amazon today, people ordered staple goods through the mail because they were cheaper. 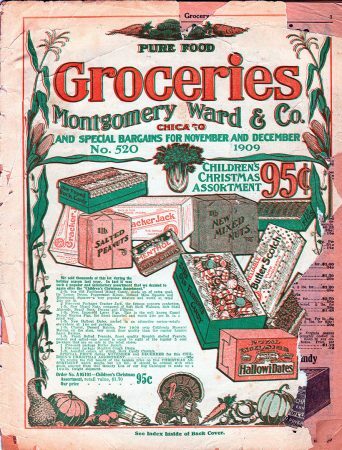 This 1909 special assortment represents some sort of apotheosis of value: literally over 100 pounds of groceries and household goods for under 10 bucks. Of course, $10 was a lot of money in 1909. Still it's hard to look at all those products spread out across the page and not feel like you were getting a mighty fine bargain. Previous Previous post: Cadillac, Jr.